Special features of the 2options.com platform are Rollover, Double Up, and Buy Me Out trading options. Plus, the Gen 2 version of the platform offers multiple views to traders. Investors can trade various expiry dates, from short 30 second trades to until the end of the year. 2options offers high payout and refund rates, thanks to its expertise in the domain of options valuation. The 2optionsAcademy offers educational materials for everyone from starters to experienced traders. Plus, this broker supports trading on the go with apps for Android and iPhone/iPad. 2options offers reliable customer support round the clock. Its well-trained agents offer trading and technical help as well as personal guidance to help traders make profits. 2options offers 24/7 live support to its customers. It's crucial to note that almost no service in the Binary Options Brokers category is a perfect solution that can match all the requirements of various investors. It may be a good idea to read a few 2options reviews first as certain solutions can actually dominate just in a specific geography or situation or be prepared with a really specific customer in mind. Others can operate with an idea of being simple and intuitive and as a result lack complicated functions desired by more experienced users. There are also services that support a large group of customers and offer a complex feature set, however this frequently comes at a more significant price of such a service. Be certain that you're aware of your needs so that you pick a service that offers exactly the elements you look for. We realize that when you make a decision to buy Binary Options Brokers it’s important not only to see how experts evaluate it in their reviews, but also to find out if the real people and companies that buy it are actually satisfied with the product. That’s why we’ve created our behavior-based Customer Satisfaction Algorithm™ that gathers customer reviews, comments and 2options reviews across a wide range of social media sites. The data is then presented in an easy to digest form showing how many people had positive and negative experience with 2options. With that information at hand you should be equipped to make an informed buying decision that you won’t regret. What Bonus Does 2options Offer? Deposit $250 and get $125 bonus from 2options.com. You can refer a friend to use this broker and get $50. 2options also offers welcome bonuses, re-deposit bonuses, special event bonuses, and personal bonuses. The bonus amount depends on the amount deposited and you can get up to 150% bonus. 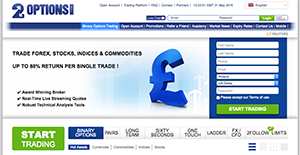 Other offers include up to 10 risk free trades and a personal trading coach. 2options.com offers efficient services that are on par with leading brokers in the binary options industry. The broker holds clients’ funds in a segregated account. It uses the funds for trading options through its website upon client’s instructions and not for any other cause. 2options.com’s liabilities and exposures are professionally handled and the broker guarantees payouts of your profits based on its terms. The company is based in Gibraltar and has made a name for itself as a reliable and reputable broker. If you need more information about 2options or you simply have a question let us know what you need and we’ll forward your request directly to the vendor.